You know those moments when you've been so busy and realise that it's been days or weeks since you've done something for yourself or treated your skin/hair/body to some much needed TLC... yup that feels like me all the time lately. I just don't understand where the hours or days go by, but they seem to whiz past in a blur and I find myself neglecting all of my beauty routines. 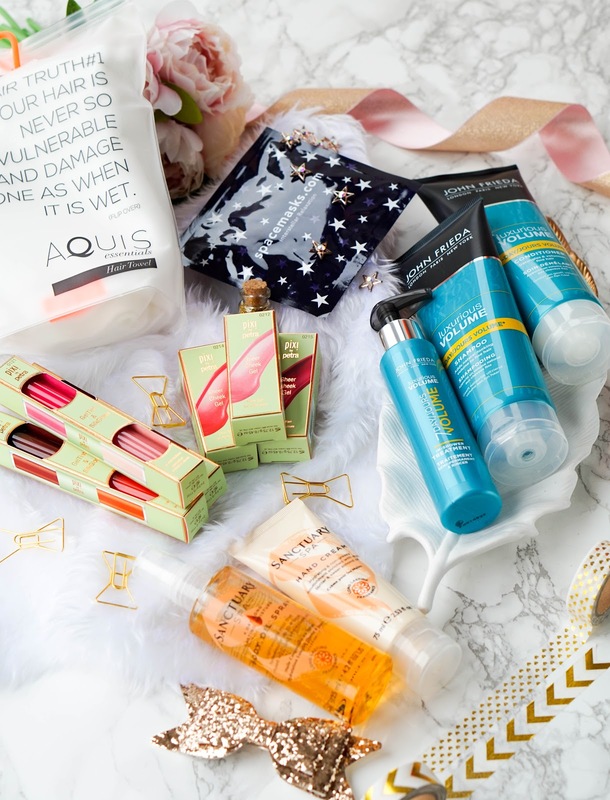 Well recently I was sent a couple of beauty parcels and decided to take some 'me time' and have a little pamper, so I thought I would share that and tell you all about it.. So first up I've got a couple of hair products, because if there's one beauty area that I neglect the most, it's definitely my hair. I am the worst when it comes to sticking to a hair routine and I just end up hiding it away in a ponytail or bun most of the time. With these new products I'm more determined to show my hair some more love and care on a regular basis. 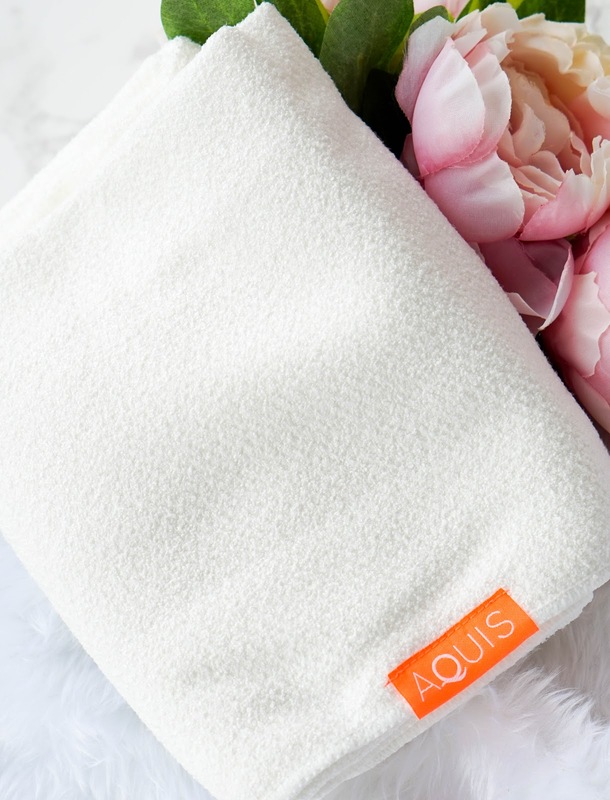 First up I have the Aquis Lisse Luxe Long Hair Towel* which I was immediately intrigued with and super excited to try out. I never blow dry my hair, I honestly don't even know why I own a hairdryer as it rarely gets used. So with this in mind I was looking forward to trying out a towel that is designed to reduce the overall drying time of your hair and improve the quality at the same time. The particular towel that I received is specifically designed for medium to long hair that is delicate, curly, fine, ageing or prone to damage. My hair is mostly fine and prone to damage since I do get it balayaged regularly, so straight away this sounds perfect. From first impressions this towel is much thinner than most of my regular towels, but it still feels like it's made of great quality material. In fact the brand use the new generation Aquitex. This is an innovative, lightweight drying system that is made using ultra-fine fibres which are split into strands thinner than silk. The way these stands are woven is designed to quickly absorb water away from your hair without causing friction. This helps to minimise stretching of hair, which in turn results to stronger, healthier and more manageable hair. I've found no problems with wraping the towel on my head, in fact it's so lightweight that I even forget that I have it on. It really does help with the overall drying time and it actually makes my hair feel softer as a result. I never realised that a quicker drying time was essential to strong and healthy hair, but now that I know all about it.. 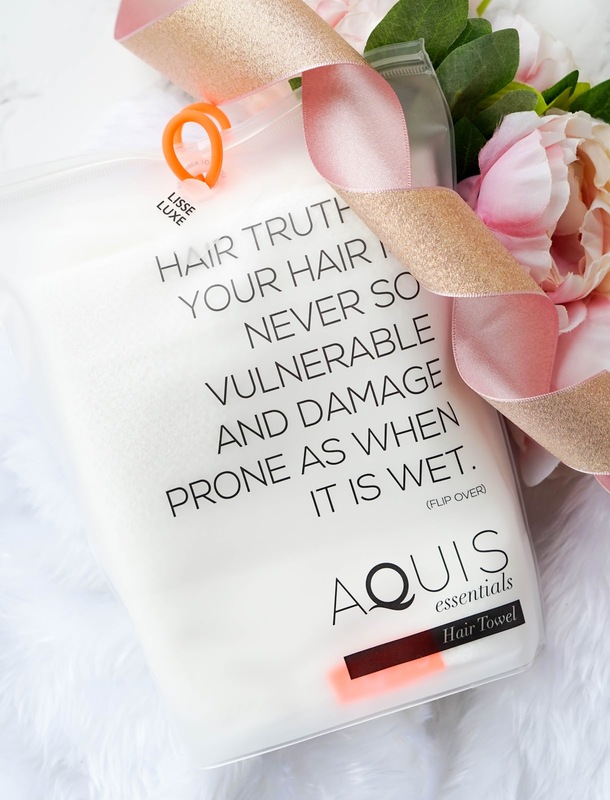 I will be sure to make the Aquis Hair Towel part of my regular hair care routine. 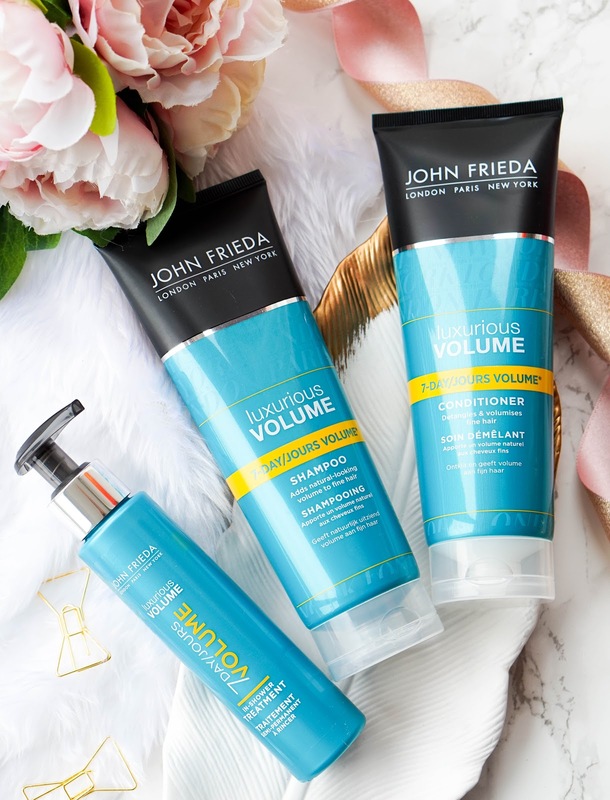 Sticking with the new hair routine, I have the John Frieda Luxurious Volume 7 Day range* which I have never tried before, even though I am a big fan of the brand in general. The products in this particular range are focused on fine hair, so they are designed to give thickness, fullness and lift. The best part is they do this without weighing your hair down and leaving a soft, natural finish. I was really surprised by how well I have been getting on with this range, it just goes to show that investing in haircare that suits your particular hair type is always the way forward. I'm also liking the fresh and clean scent of these products, they just make the whole experience quite pleasant. So the trio that I've been using from the range consists of firstly the Luxurious Volume 7-Day Shampoo* followed by the Conditioner*. I'm not sure about the 7 day claim on this range because I have to wash my hair every other day, it's just the routine that my hair is used to. 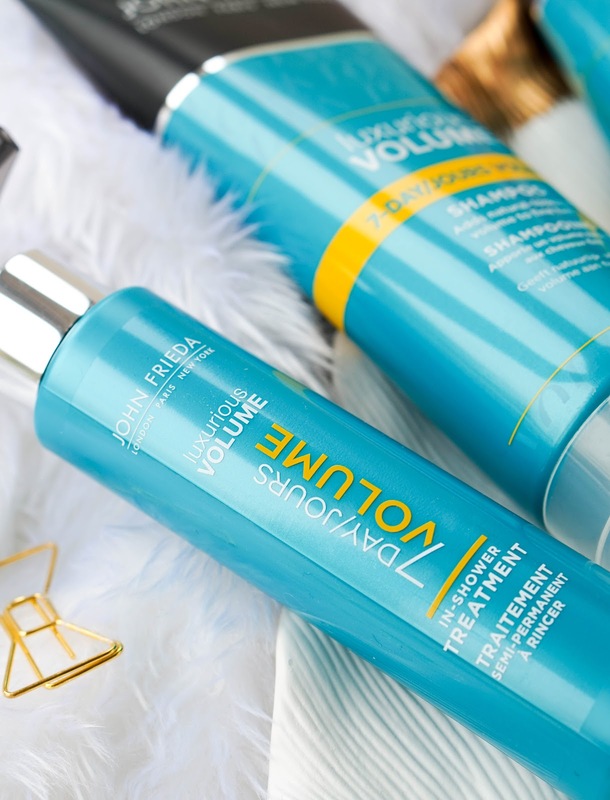 I've used volumising products before that left my hair feeling rough and quite dull, but this duo is different since there's no silicone residue. They don't strip my hair of its natural oils, instead they feel hydrating whilst adding volume too. Next is the 7 Day Volume In Shower Treatment* which is definitely a new step to my hair care routine. Once you have shampooed and conditioned your hair as usual, you can then go ahead and use this extra step for added volume. You basically apply 3-4 pumps to wet hair, making sure to cover the entire length including under sections and root area. Once it has been left on for up to 5 minutes, you can then rinse it out and style as usual. This semi-permanent treatment is only recommended every 2-3 washes, so I personally use this once a week. The product has been designed with volume polymer technology, so the result is impressive as it instantly amplifies and thickens the hair. I'm really happy I've discovered this range, especially the treatment as I am a big fan of the results. Is it just me or is this constant heat drying out your skin also?! I dunno what it is but my body is super dry at the moment. However in this heat, applying thick body lotions is the last thing I want to be doing. So I have opted for the Sanctuary Spa 4 Day Long Lasting Moisture Body Oil Spray which immediately attracted my interest on my last Boots shopping trip. 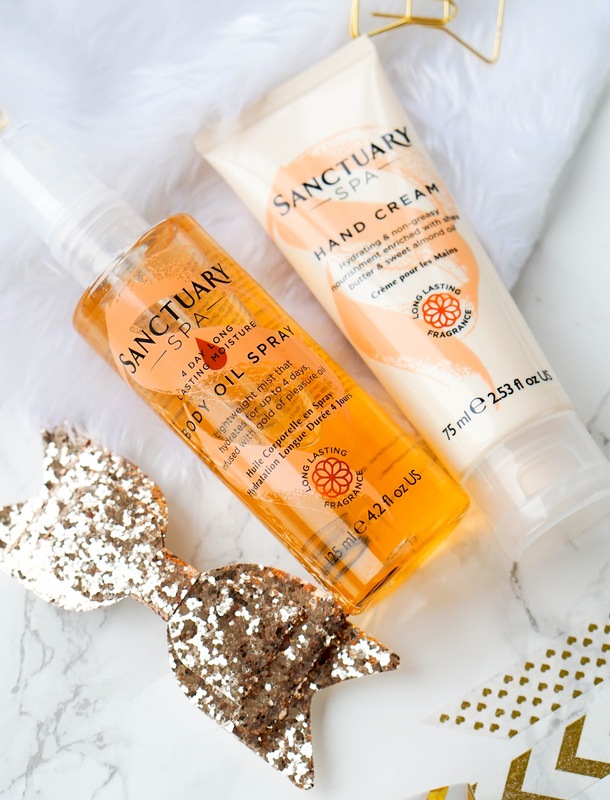 Firstly I love the packaging, has Sanctuary had a makeover or is this a completely new range?! Either way I love it and find that it looks a lot more high end than the affordable price mark. This is a two-phased spray with luxurious golden oil at the bottom and water on top of that. The formula is essentially a blend of vitamin E and olive oil to keep the skin soft and nourished. What I enjoy the most is just how easy it is to apply and the fact that it's quickly absorbed into the skin without leaving a greasy or sticky feeling behind. The best part is once I am finished applying this (which literally takes me a couple of minutes.. winning), my skin looks illuminated and it feels healthy too. It really is a brilliant little product and I am hooked. Since Boots had a buy one get one half price on Sanctuary products, I couldn't turn down a good deal so I also picked up the Sanctuary Spa Hand Cream. This cream smells absolutely delightful, it really does remind me of being in a spa. It's also super hydrating from the blend of Shea butter and sweet almond oil, so it really nourishes my dry hands. What I love most is that it leaves an almost velvety soft finish to my skin.. huge thumbs up from me. Next we are moving on to the relaxation part of this TLC routine, with the innovative Spacemask*. I have been seeing these interstellar relaxation eye masks all over my Instagram feed, so I was definitely intrigued before I even got my hands on some. 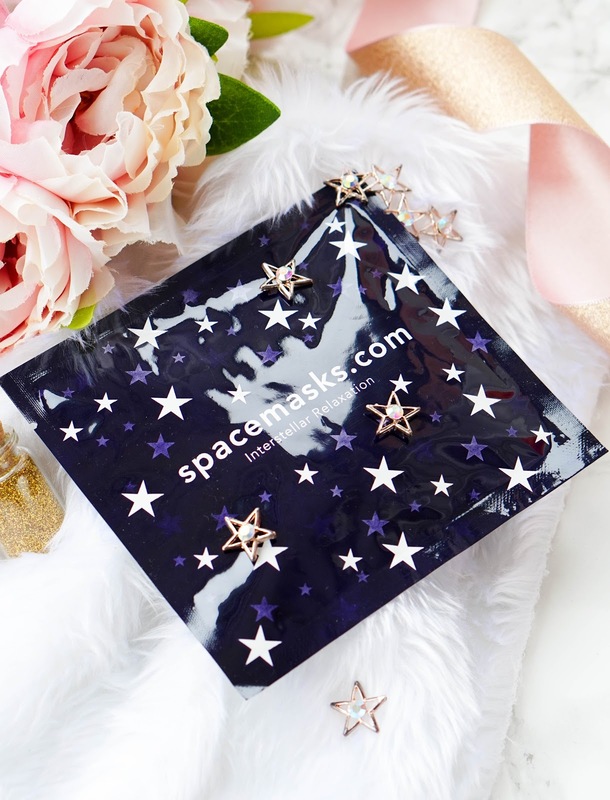 Spacemasks are completely new to the beauty market and it's basically an eye mask to help you relax, recover and reenergise. Each spacemaks is individually packed in a little pouch and it won't be activated unless the packaging is opened. I love that it has a self-heating element, which means that it slowly heats up when it starts reacting with oxygen. This gentle heat is paired with a light jasmine fragrance to help you relieve tension and soothe the eyes. I like using this at night, when I've had a busy or stressful day and my brain is basically in overdrive. It really does make me feel completely relaxed and I usually fall asleep before the 15 minutes are up (which is how long the mask stays heated for). Just be aware that the mask heats up super quickly when opened, so be ready to relax straight away. I have already ordered more and they will forever be part of my bed time routine from now on, since they are also great value for money priced at £15 for a box of 5 masks. Definitely something you need to add to your wishlist and try out for yourself to see the benefits. 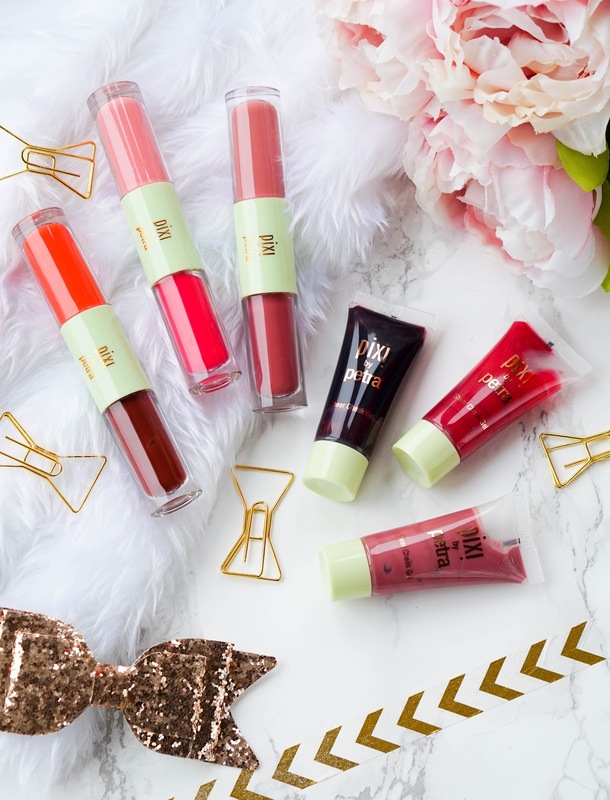 I forgot how much I used to enjoy lip tints like these, because essentially they provide a long-lasting tint & leave a beautiful stained effect behind (best part is you don't need to worry about touching up or re-aplying throughout the day). So that's the first part of this new lip product. The second part which can be applied throughout the day is the gloss. 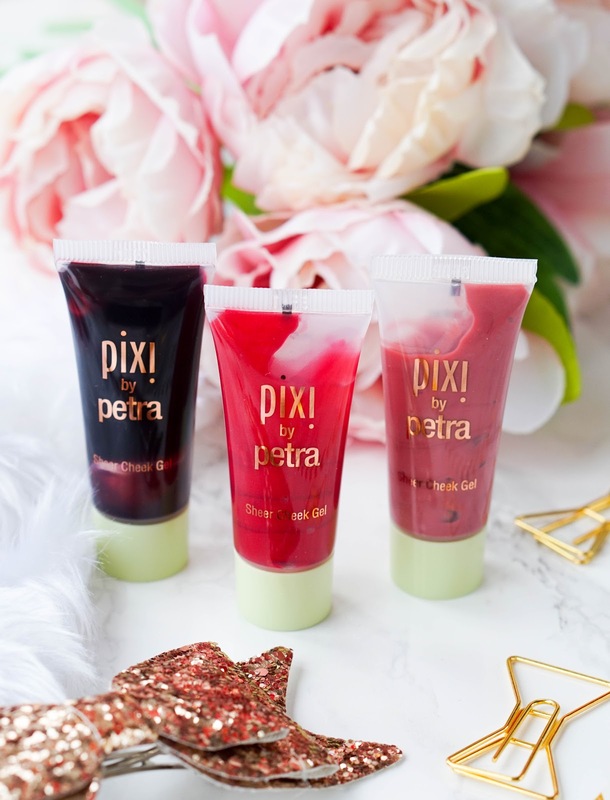 This helps to nourish the lips, whilst adding a stunning glossy and plumped up finish. The gloss is quite sheer and has a very light peppermint scent, which I enjoy. I don't remember to apply this frequently through the day because as you can guess it's a gloss so it doesn't really last very long, but as long as the tint is there I am still happy with the overall finish. I don't really like using gel or cream blushes if I have foundation on, but that is a rare occasion for me these days. So if I'm just using concealer (most days) or a light base like a tinted moisturiser, these blend super effortlessly and look so natural. I usually apply these with my beauty blender as I don't want to tint my fingers, which trust me does happen. 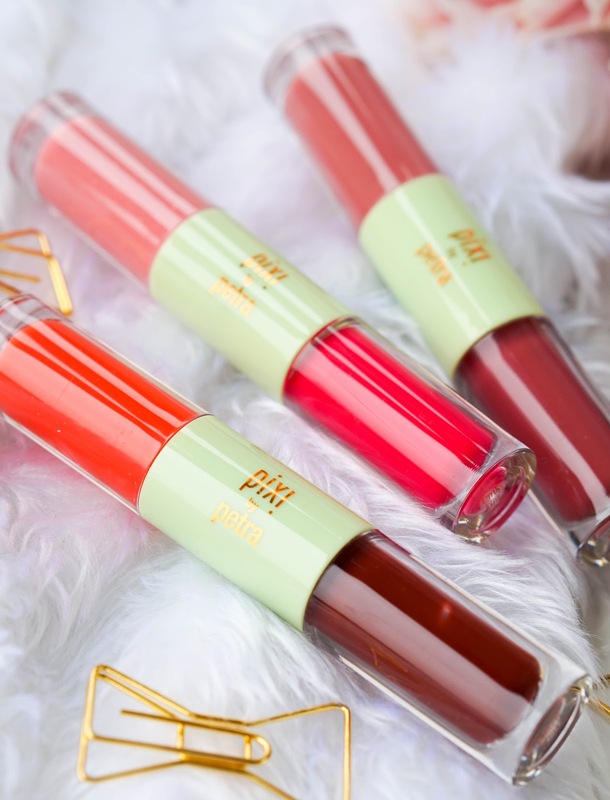 Since they are basically a gel tint, it also means that they are super long lasting and you don't need to worry about touching up for the rest of the day. A little bit goes a long way with these blushes, so start off with a tiny dot and build up to your personal preference, to avoid going overboard straight away. I don't have anything negative to say about these new beauties and they have become a summer staple for my barely there makeup looks. Wow that was a lengthy post, have you made it to the end? If you have, you certainly deserve a pat on the back. I would love to hear your thoughts on any of the products above.. Have you tried any of the brands? What is your go-to TLC routine?